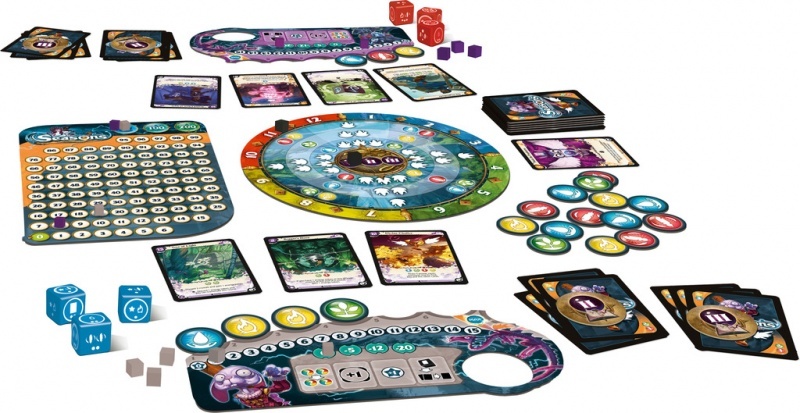 We review the new board game Seasons, by Asmodee Games. 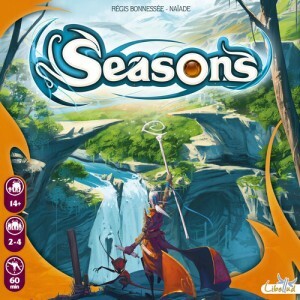 Seasons is a game that combines card drafting, dice rolling and resource management. With great artwork and high quality components, this unique game has a lot to offer. a couple of times and I don’t think I was every close to winning any of them. Seasons may have some great components, but it is also a bit unforgiving with a steep learning curve. Seasons broken up into 2 main parts. The first, is the card draft (players new to the game are encourage to skip this part and go with a default starting deck). The draft works as many other games, where you are handed cards, choose one and pass the rest along. You play in this manner until you make your initial starting hand of 9 cards. The main game is where you will spend most of your time though. In the main game, you will find elements of Dominion, Magic: The Gathering, or Quarriors. The tournament portion of the game is played over a series of 3 years (rounds). Each year you be playing 3 of your starting 9 cards. Dice are rolled each turn that let you know what resources you get that rounds. The game has a central board to track the game progress and conversion values. Each player has their own player mat to track resources and there is also another board to track VPs. If that seems like a lot going on, it’s because it is. And we’re only getting started! One thing Seasons has going for it, is it’s amazing components. The artwork is just gorgeous and is probably what drew gamers to it to begin with. In addition to the great artwork, there are also the 20 dice. 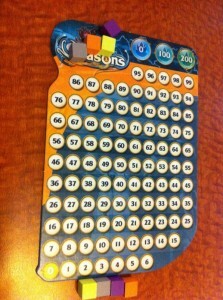 Each “season” gets its on unique set of colored dice. Blue for winter, red for fall, etc… The dice are all somewhat different from season to season and even from within the season. You also get 100 cards (2 of each) that look beautiful, yet are still functional. 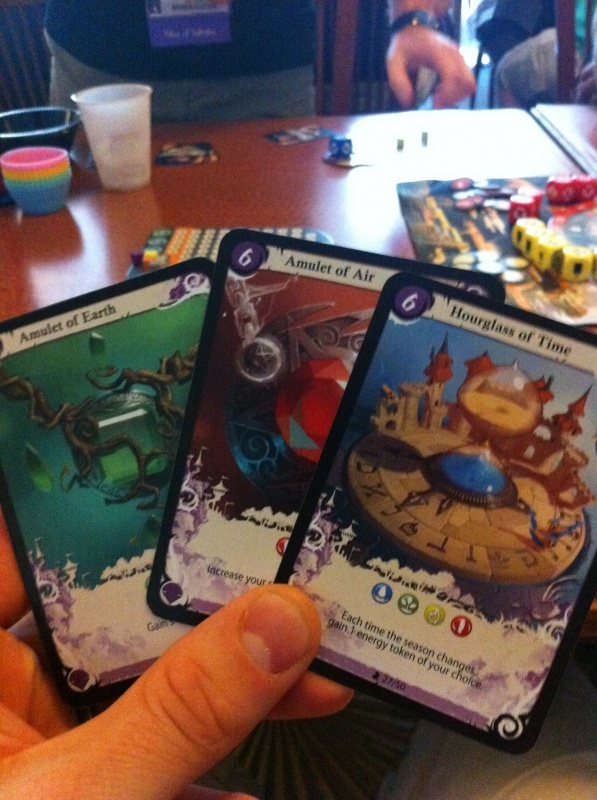 Add all that together and it’s clear that Asmodee Games didn’t skimp on the components. So the nuts and bolts of the game are where things get complicated. First, let me say right away, despite the attractive artwork, this is not a game for your non-gamer friends. They will be overwhelmed. I’ve covered the drafting already. Once that is done and you have your nine cards, you have to separate them into 3 piles. In the first year, you get pile 1. You get the other cards in year 2 and 3. This requires a decent amount of planing ahead. I screwed myself in my first game because I didn’t quite understand this mechanic and found myself with some bad cards in year 1. With all that done, you are finally ready to play. 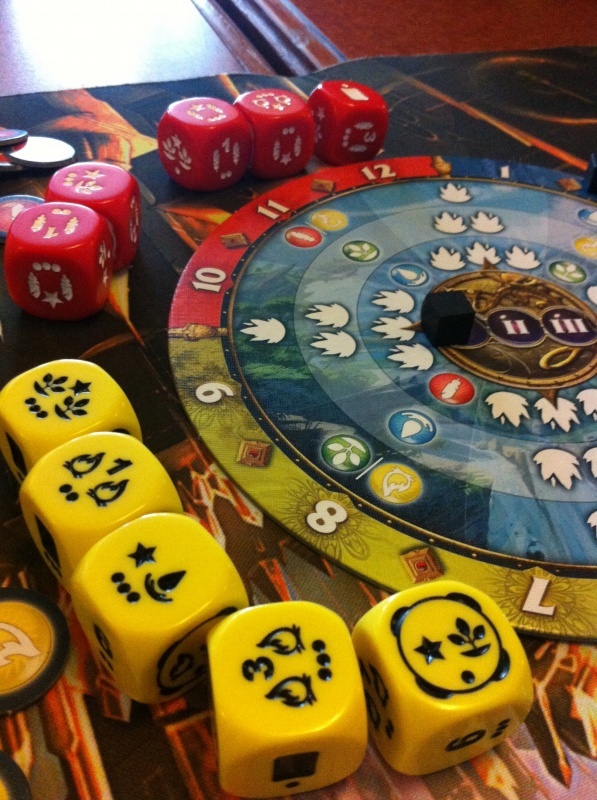 The first player, takes the correct number of dice for the seas you are in and rolls them. At that point, each player takes 1 die and puts it on his player mat (being careful to not change the top face). The last die is left in the center board to be used later. In addition to the actions from your die, you can also play cards from your hand. And you want to, any cards left in your hand at the end of the game are negative to your score. The cards have a bit of variety to them. Some are instant effects, others are constant abilities and some are triggered when certain things happen. Every card has a casting cost and also is worth victory points. The casting costs are usually energy tokens or crystals (VPs). All cards are played in front of the player and you can only have as many cards in play as your summoning strength (tracked on your player board). One final thing you can do on your turn is use a cheat. 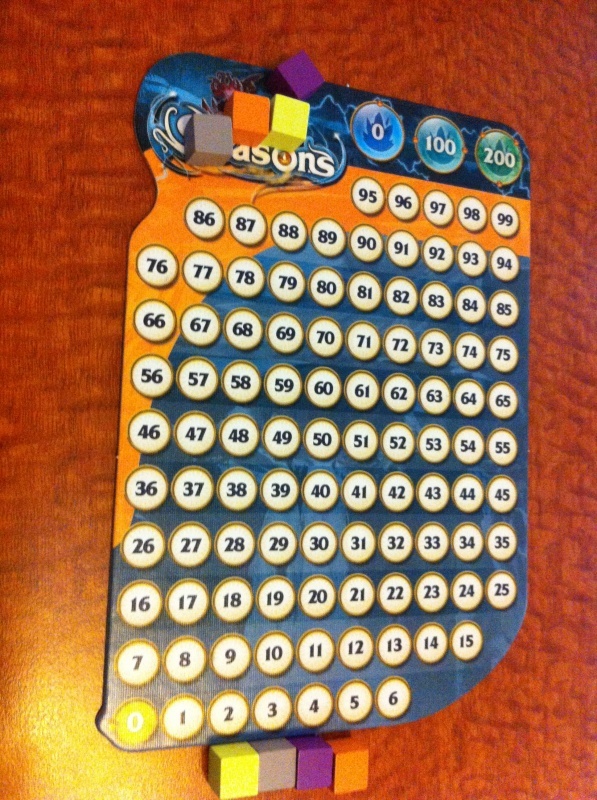 Each player board has 4 “cheats” you can use once during the game. They do things like give you resources you might need or boost your strength. The downside is that each one you use will reduce your total VPs at the end of the game. The penalty is not even, so the more you use, the more points you give up. After each player has taken his turn, you examine the remaining die that no player chose and move the season marker a number of spaces equal to the pips on the die. Once you cross to a new season, you use the new dice and the new transmute values. Once you go all the way around the board the year ends. If it was the 3rd year, the game is over. If not, play continues, but you pick up your next pile of cards. And that’s the majority of the game in a nutshell. Like I said, there is a lot going on. I must admit, the few times I’ve played this game, I’ve been bad at it. I think this is one of those games that will just take a while for anyone really to figure it out. There are a lot of moving parts to keep track of and a lot of ways to screw yourself over. However, once you get an understanding of the game, there is a deep complexity there. With multiple resources to keep track of, all with changing value, Seasons has a lot to keep you interested. The components of Seasons do make this game an absolute joy to play. The artwork is nothing short to stunning and rolling those dice are a lot of fun. However, those same dice add a lot of luck to the game and, depending on where you are in the order, you could easily get screwed out of what you need for a couple of turns in a row. Seasons is a game that will benefit anyone who has a deeper understanding of how to play the game. There is a lot of strategy to be had while playing and anyone who is familiar with all the game cards and parts will have an advantage over a newer player. But don’t let that dissude you from giving this game a try. Seasons is a lot of fun. You have a lot of choices on your turn and sometimes tough decisions to make. I’m sure Asmodee is making expansion packs, so that can only add to the replay value of Seasons. This was a hard game to rate. On one hand, the game has a lot of potential. It has, deep, strategic game play. However, it also has a lot of luck. If the dice don’t roll what you need (or you are last in picking when they do), you could get screwed for a number of rounds (happened in our game). I also think you need to play this game a lot to truly be any good of it. It’s a hard game to teach new people. All that said, when you actually do get down to understanding the game, it’s a lot of fun. There is a ton of variety, which means it has a lot of replay value. I bought a copy of this game, sight unseen, at Gencon this year. It was the hot new game and they only had a limited number of copies. After playing it a couple of times, I ended up trading it away for some other games. I think the game just has too steep a learning curve to get much play time with our group.
. However, if your group is more a casual one, then this is not the game for you. It’s not the type of game you can pick up once a year or so and feel good about knowing what’s going on. Final Score: 3.5 Stars – A fun game with a lot of unique rules in one game, however there is a steep learning curve.